Using experimentation as a common thread between our work, we aim to fight the conventions set by our respective mediums and further expose the beauty in the disintegration of their traditional use. Together, the two of us have decided to work off of each other’s constructed imagery, to combine our experimental techniques, both in the darkroom and on the pedal board. Our reactions and collaboration will be used to create an immersive, interactive installation that will capture its viewers in the waves of sound and object. By recording one another’s creation we hope to develop a union between sound and image that can carry its viewers through our dream piece and rediscover our work in a new light. VSW’s Project Space is the perfect venue for this, offering a community of artists that are constantly confronting traditions in similar media and reinventing the way we view them. Rebecca Lomuto is an artist, educator and member of the local group Politits: Art Coalition in Rochester, NY. As a printmaker, she incorporates aspects of photography, paper-sculpture and bookbinding. 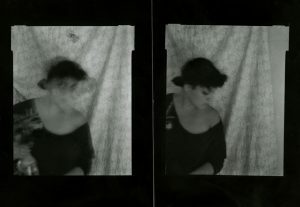 Her work often meditates on aspects of identity and erasure of personal history, using process-heavy mediums and experimental techniques. Joseph Clark is a Rochester-based musician and a member of the band Druse. His solo work, “a dreamy guitar drone that fills every corner of the room… [full of] delicate delayed whispers,” is a manipulation of sound as an earnest translation of the beauty to be found in this often gloomy world.